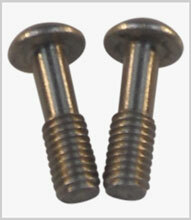 Captive screws are retained by means of having a reduced diameter shank following on from a standard screw thread – usually with a raised head for tool or manual operation. Standard metric sizes, materials plated steel or stainless steel. This is one style of fastener which is often required to custom dimensions as they must be a correct length to suit the application.